Lean is a completely different way of looking at your business. The focus in a Lean environment is on building consistency and efficiency into every step, installing feedback loops to measure quality at each step, and being obsessive about reducing waste – thereby getting a better product to the customer faster, and improving cash flow. The focus is on raising the quality of the product or service and boosting workplace productivity through employee involvement in reducing waste. 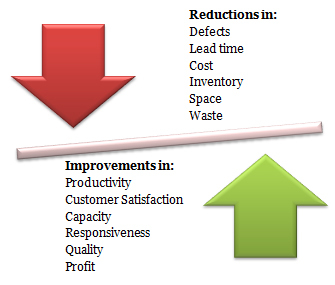 By applying the lean principles, you can impact most of the key metrics for your organization. How is it that HR's processes have by and large been exempted from the Lean movement? ...HR departments can now become full partners with other functions in the organization that operate in the Lean methodology.